POOL SERVICE SCOTTSDALE CAN TRUST! Reliable Pool Care lives up to its name. Dustin has come to our home a number of times to fix various problems with our aging pool equipment, and he has always done a very professional job. Dustin is willing to take time to explain what is needed and to suggest ways to improve our system's performance. We feel we can trust Reliable Pool Care to give us honest advice along with service that is efficient, friendly, and reasonably priced. Dustin is so helpful and knowledgeable. I owned a pool many years ago and just got back into a home with a pool now and Dustin was super about helping me remember all the important points of pool care. When I had an emergency this past week and needed help quickly, he answered the call, helped me with some initial diagnosis, and then rushed over to help resolve everything. He is great about explaining the little things that can make pool care easier and less stressful. Bottom line...it is great to know I have someone I could trust from the start and rely on for quick, honest, and thorough pool service. I am very happy with this pool service. They are knowledgeable and do an excellent job. They always respond to my questions quickly. They are professional and I would recommend this company to any of my friends and family members. I was unhappy with the old pool service we had and am glad we found this one. We have quite a few trees that are always leaving tons of leaves in the pool, but they do a great job maintaining the pool. Dustin does a great job and most of all, does what he says he'll do, which is not common these days. I have several rental properties and he maintains the equipment and pool as if I personally were there and I'm 1200 miles away. Always communicates with me if there are any issues, looks for solutions and does a good job with several options and keeps the price reasonable. My tenants are pleased with him as well. I would definitely recommend Dustin. Fill out the form below and one of our pool specialists will contact you shortly. Reliable Pool Care is a local family owned and operated swimming pool maintenance and repair company. We care about family and community. 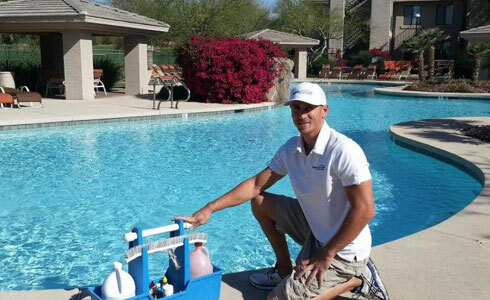 Our mission is to provide reliable, affordable pool service to the Scottsdale and Paradise Valley areas. We will ensure your pool is a safe and fun place to make memories with your family and friends. Why you need weekly pool maintenance! If you are the do it yourself type (DIY), there are many things to take into consideration when maintaining your own swimming pool. Pool water chemistry can be one of the most important aspects to swimming pool maintenance. It is common to think that just throwing a couple chlorine tabs in each week is all that is needed. Despite what you might believe, this can cause bigger issues if other chemicals are not checked regularly. Chlorine tablets have CYA (Cyanuric Acid) which is necessary for pool water to hold chlorine levels in the hotter months. The drawback is that if the CYA levels get too high, the only way to get it lower, is to drain the water out. Other issues this can cause is calcium build up on tile, stone and rocks. Cloudy pool water can be caused by many things: inadequate chlorine levels, pH imbalance, the environment (pets, trees, gardens, weather, algae), high calcium hardness, or poor filtration. Pools can turn cloudy very quickly and can be difficult and time consuming to turn back to normal. If you notice your pool is cloudy, give us a call. Reliable Pool Care can help prevent cloudy water by maintaining a proper pH balance, cleaning your filters twice a year, checking your chlorine levels, and testing your water each week. If your pool is surrounded by trees or constantly has leaves blowing into your water you may want to invest in an automatic pool vacuum. Reliable Pool Care can help prevent algae from ever starting to grow in your pool with weekly service and algae treatments. We also provide quality automatic pool vacuums that have helped many of our customers avoid algae in their pool. Why is my skin itchy after swimming? Reliable Pool Care will regularly check your chlorine levels and the pH balance to help keep your pool a safe place to play, swim, and relax. Why do my eyes turn red when swimming in a pool? Your eyes should not turn red after swimming. This is a sign that your pool water is not safe to swim in and you should get out and rinse off immediately. Many people think red eyes are caused by chlorine. This is true to an extent. Red eyes can be caused by urine mixed with chlorine. The truth is chlorine’s main job is to prevent bacteria in your pool such as E. coli. When urine or other bodily fluids are added to your pool water chlorine has a difficult time keeping up. I added shock to my pool, but I still see algae. Why? 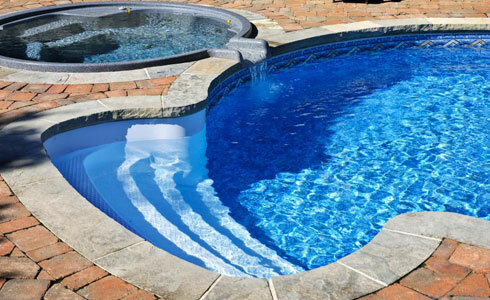 It is important to know that you need to brush the sides and floor of your pool before adding shock. Neglecting to do so makes it more difficult for the shock to do its job and tackle algae. A bad filter or poor filtration system might be the cause for algae or cloudiness after adding shock. 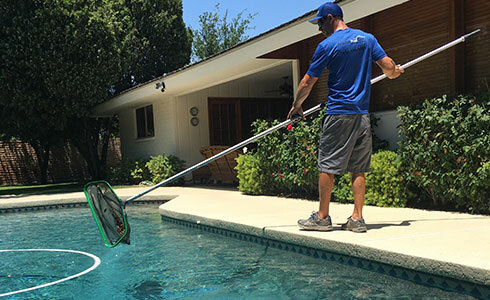 The amount of time it takes for your pool to become clear can depend on the type of filter, if the filter is clean, and if it is functioning properly. A high pH level or inadequate chlorine level can prevent the shock from killing the algae. A healthy pool does not smell like chlorine or chemicals. A strong chlorine or chemical smell may be due to a high pH level which causes more production of hypochlorite ions (weak chlorine) versus hypochlorous acid (strongest and most powerful killing form of chlorine in water). If the pH level is too high, then it creates a bad environment where there is less of the killing form of chlorine in the pool and more of the weaker form of chlorine. This creates an unsafe swimming pool. A strong chlorine smell can also be caused by chloramines which are a mixture of chlorine with urine, sweat, and other bodily fluids released into pool water. Chloramines can also be caused by rain or lawn products mixing with chlorine. If your pool has a strong smell stay out of the water until a trained pool technician fixes the problem. Also, keep pets away from the pool as chloramines can be poisonous to animals and fish. Proper weekly maintenance can help prevent chloramines from ever forming in your pool. When chlorine combines with ammonia and nitrogen compounds in water it forms chloramines. Chloramines cause your pool to smell like chemicals and can cause irritations to the eyes, skin, and lungs. Ammonia and nitrogen compounds can come from sweat, urine, saliva, rain, and lawn products. Why is my pump making a loud whining noise? The cause of a loud whining noise coming from your pump could indicate that the bearings on your motor are starting to go bad. The bearings are mounted to the motor to help reduce friction. Replacing bearings is labor intensive and usually requires a special bearing puller to remove them. Because the motor bearings can not be lubricated they will either need to be replaced or the entire motor will need to be replaced. It is best to have a professional replace the bearing, unless you have experience in replacing sealed pool pump motor bearings. Incorrect placement or the wrong bearing could permanently damage the motor. The noise could be due to a problem with the pump. 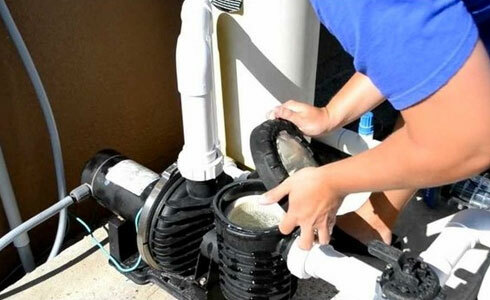 If the pump is not getting enough water it can cause a high pitch noise. Having your pump repaired or replaced could fix the problem. A problem with the impeller could also be the source of the noise. It may need to be repaired or replaced.